As with any form of media that causes controversy, my image of an ATV filled with dead mountain hares is no different, and has already fuelled some rumours out there, that I feel ought to be stopped in their tracks now. The photo was taken on 28th February 2017 at 3:59pm. It was taken on the Farr Estate in Scotland, outside of the Cairngorms National Park. The ATV was on a public road. The actions of the people involved are legal. I was alone when I took the image. I wasn't looking to take such an image - I was hoping to photograph live wildlife. I had been photographing a pair of red grouse, that appeared to be spoiling for a fight so parked up just off the road, and had my large lens poking out of the car at the birds. The ATV drove past me about half an hour earlier, whilst I was still pointing my lens out of the window. 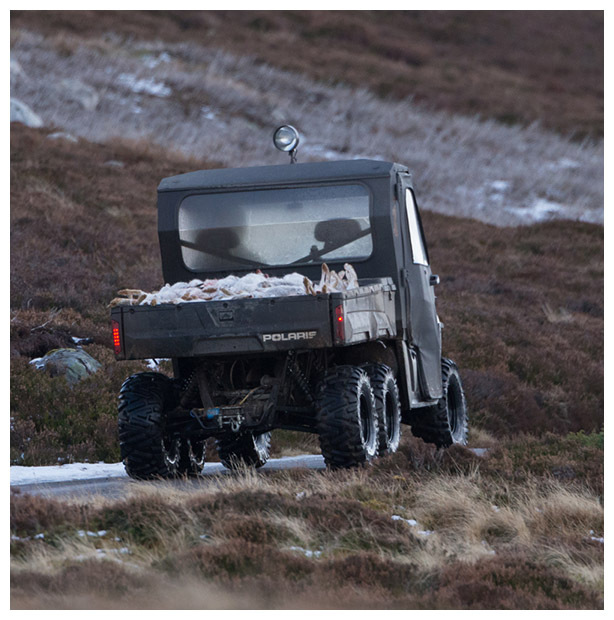 The ATV returned, and drove back past me in the other direction, and I hoped as it went by it might spook one of the grouse into flying off. When it didn't, I glanced up at the ATV and spotted something in the back. I raised the camera and took a few shots to see what it was. I was sickened by the sight of the dead mountain hares, as I adore these hardy, elusive creatures, and hate to see them dead beside the road, let alone deliberately killed. The ATV quickly vanished over the hillside and I didn't see it again. I have made no money from the image, and don't intend to. It is available for free via Wikimedia. I'd rather make money from images of live wildlife. My tweet asked the question: "Is it really necessary?" I know that hare culls are indeed necessary in some locations, and when their numbers are too great (though wouldn't it be lovely if perhaps eagles were allowed to manage such populations?). The reason I asked it here was because I hadn't seen a single hare on that estate during visits in January and February 2017. In my opinion, the estate was lacking hares, so to see them being culled begged that question. I have had a great deal of supportive messages via social media, and for them I am grateful. I have also had some abuse (and I expect more of it) and attempts to get me involved in debate. I will ignore all such comments, so don't waste your time. I am leaving the arguments and debates over this issue to those with greater knowledge and all the facts.